Qith possible tough economic times ahead, the Q offers up this economical, relatively safe and practical in-line water heater. The parts can be purchased separately or in a kit, which includes 100 centimetres of metal wire, a box white candles and a box of matches, with instructions on the possible uses. 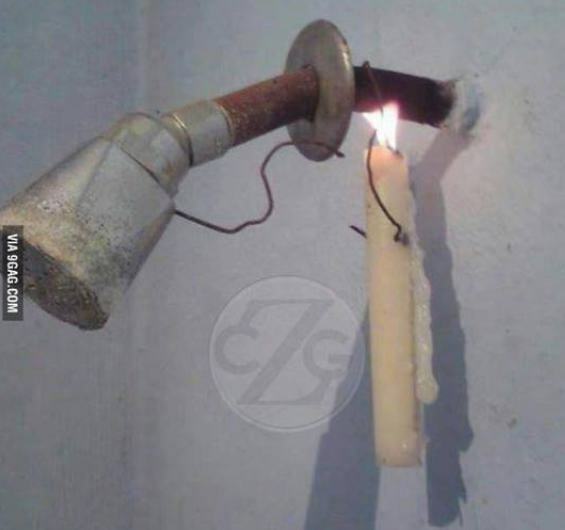 The concept is simple and can be macgyvered to any shower or water pipe. A lit candle is placed under a water pipe, the water is heated as it passed over the open flame and you have instant hot water. See diagram. In Costa Rica the economic heater can save thousands each month on electrical bills and removes the danger of being electrocuted by a Lorenzetti electric shower head.